What Are ‘Nation’ Interns Reading the Week of 11/20/14? What are interns reading for the week of 11/20/14? "Machil sentencing: 3 lives taken for the sake of medals, each bought at Rs 50,000," by Muzamil Jaleel. The Indian Express, November 14, 2014. Three Kashmiri men executed in cold-blood. Their bodies lay dead near the Line-of-Control after a “shootout” in the mountains along the Indo-Pak border. The army says they killed three infiltrators, “Pakistani terrorists.” It turns out, they were not. The eleven people accused consist of a Colonel, two Majors, five soldiers and three civilians. This is the Machil fake encounter case, where these three young unemployed men, lured in the false pretenses of jobs, were taken to the border, and then killed. One of their faces was cosmetically darkened to give the appearance of a beard. His name was Shafi Lone – he was only 19. I visited the families of the victims back in March for a story, where they desperately hoped for justice in a process they cannot fully understand. Earlier this week a decision finally came, an Army court martial concluded the case. In a rare instance of justice against uniformed men in Kashmir, five of them were sentenced to life in prison. The sentenced men can appeal, but this is a small victory for justice, in a place where justice is often skirted, and more often, outright denied. “Lost in Rawlsland,” by George Yancy and Charles Mills. The New York Times, November 16, 2014. "Transgender Pioneer and Stone Butch Blues Author Leslie Feinberg Has Died," by Advocate.com Editors. The Advocate, November 17, 2014. “Double Jeopardy” by Paige Williams. The New Yorker, November 17, 2014. After convicting Shonelle Jackson of capital murder in 1998, an Alabama jury unanimously rejected the prosecution’s request to sentence the teenager to death. But, as Paige Williams points out, capital cases in Alabama don’t end with the jury’s decision. “The state’s judges can exercise an unusual power: they can ‘override’ a jury’s collective judgment and impose the death penalty unilaterally.” Although Jackson's role in the murder was unclear, the judge in his case decided to impose the death penalty anyway. Williams’s latest story for The New Yorker is framed around Jackson’s saga and uses his narrative to show how judicial overrides cast a pall over criminal justice in Alabama, especially when elected judges are able implement them to appear tough on crime. “We Need Doula Care to Achieve Reproductive Justice,” by Elizabeth Dawes Gay. RH Reality Check, November 11, 2014. Women dying during childbirth in the US in 2014 is not what comes to mind when discussing maternal mortality. But the US ranks only fiftieth in the world for maternal health, despite our massive spending on healthcare. It is sad and shocking that since hitting a low in 1987, maternal mortality rates in the US have grown at alarming rates. There are very specific communities that feel the effects of these terrifying numbers. African American women are four times more likely to die in childbirth than white women. The reasons for this have a great deal to do with the inequality in our healthcare system. According to reproductive health experts and reproductive justice advocates, there is a simple way to fix this problem. Doulas, who act as advocates for pregnant women before, during and after childbirth, make a huge difference in healthcare outcomes, especially for women of color. Elizabeth Dawes Gay, over at RH Reality Check, reports on how doula care can reach more women. With the expansion of healthcare coverage through the Affordable Care Act, millions of women now have access to medical care. However, doula care is not included in any of the expanded women's wellness coverage by the ACA for private or public insurance. If Medicaid coverage was expanded at the federal level to include doula care, women all over the country who previously have not been able to employ doulas as part of their birth plan would now have the option. Only women in Oregon and Minnesota have the opportunity to have doula care reimbursed under Medicaid. These failures to ensure the health and safety of pregnant women of color and their children are unacceptable. Reproductive justice means being able to choose how you give birth, and the seemingly obvious ability to labor and deliver a baby in a safe environment where you are getting the medical attention you need and deserve. If doulas can help make this a reality, let's expand doula coverage nationwide now. "Whatsapp Just Switched on End-to-End Encryption for Hundreds of Millions of Users" by Andy Greenberg for WIRED. November 18, 2014. Now that Congress has refused to reform government surveillance and address society's privacy concerns, messaging giant Whatsapp is implementing an encryption system called Textsecure, upgrading its security standards. I think this piece is relevant because it highlights the fact that even the private sector is taking steps to protect people's right to privacy—in fact, major tech companies like Google and Facebook supported the USA Freedom Act that Congress just blocked and would've overhauled NSA surveillance—while the government stands still. "Congress is irrelevant on mass surveillance. Here's what matters instead.” by Glenn Greenwald. The Intercept, November 19, 2014. This piece is both a good explainer of the "USA Freedom Act" (the NSA "reform" bill) that failed in the Senate this week, and an outline of the ways the world has changed in response to the Snowden revelations. Greenwald's point boils down to 'chin up, people': "the battle is underway," he writes, "and the forces of reform are formidable—not because of anything the U.S. congress is doing, but despite it." 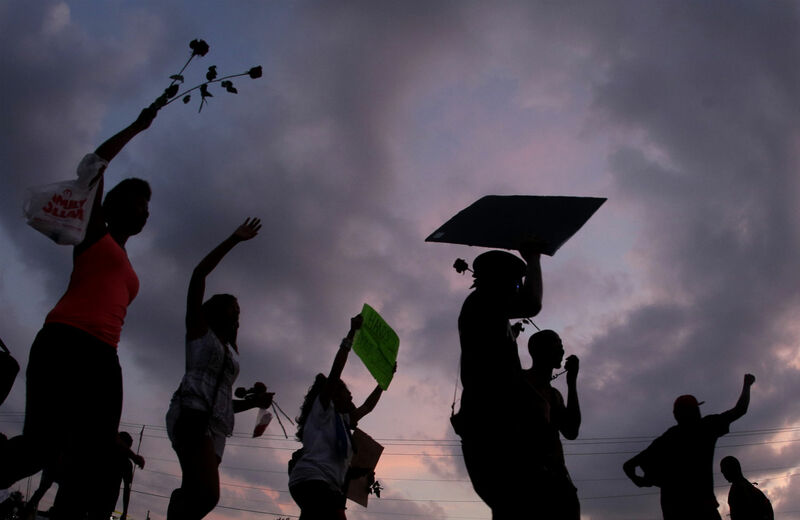 “A racial state of emergency: How we prepare for devastation in Ferguson,” by Brittney Cooper. Salon, November 19, 2014. In her column this week for Salon, Dr. Brittney Cooper asks us—as Black people and as allies who love Black people—to find joy in the calm before the storm. Cooper urges us to find joy however we are able to in a moment pregnant with the expected non-indictment of Darren Wilson. For her, joy is a Black woman director's filmic representation of the Civil Rights movement of the 1960s, set in the U.S. south. Ava DuVernay's Selma is the aesthetic portal to a joy that shields against the violent crucible of race in America and, according to Cooper, an artistic force to inspire a burgeoning movement. The historical continuity between the Civil Rights movement of the 1960s and today's resistance makes legible both how we inherit struggle as genealogy and the timeless indomitability of the Black spirit. In Selma, in Ferguson, in the wake of Black death and the storm of unrest that inevitably follows, Black people go on living and resisting—and that's beautiful. Cooper and DuVernay remind us: we have been here before and we will be here again, it's our ancestors' stories that give us strength to go on. "There are films that galvanize movements," Cooper writes. "As I sat watching 'Selma,' I knew this film would be one of them." High praise indeed. Over the past few years, media personalities have described the lack of black fathers as an “epidemic of fatherlessness.” However, in a 2013 Center for Disease Control and Prevention released a report indicating that black fathers are more active with their children than white and Latino fathers. Stacia Brown profiles four black fathers who are confirming the findings of the CDC report. They have their own entry points to fatherhood, but nevertheless they are rewriting the narratives of black fatherhood in our world. "Death by Deadline Part One," by Ken Armstrong. The Marshall Project, November 15, 2014. The Marshall Project launched this week with a multi-part feature that looks into how lawyer error can prevent death row inmates from getting a final appeal. The story opens by explaining the case of Kenneth Rouse, who was tried by an all-white jury. After he was sentenced to death, one of the jurors revealed that he thought "he thought black men (“niggers” was the term he was quoted as using) raped white women for bragging rights." Although the claim for juror bias was undeniable, Rouse's final appeal was never heard. "Under the Antiterrorism and Effective Death Penalty Act of 1996, Rouse's lawyers had just one year after his initial state appeal to petition for a last-resort hearing in federal court. They missed the deadline by a single day." Rouse later received a second chance under North Carolina's Racial Justice Act, but many inmates in his situation weren't so lucky. Armstrong's investigation shows that since the one-year statute of limitations was signed into law, the deadline has been missed "at least 80 times in capital cases. Sixteen of those inmates have since been executed." As for Rouse, his appeal is still pending.